Is it too early to be ready for everyone to be back in school? Probably!!! I know the teachers are at least feeling this way. :) I created this card using the Mojo Monday challenge to make a round or square card. I always like creating little round ones...it's a nice change from the norm! 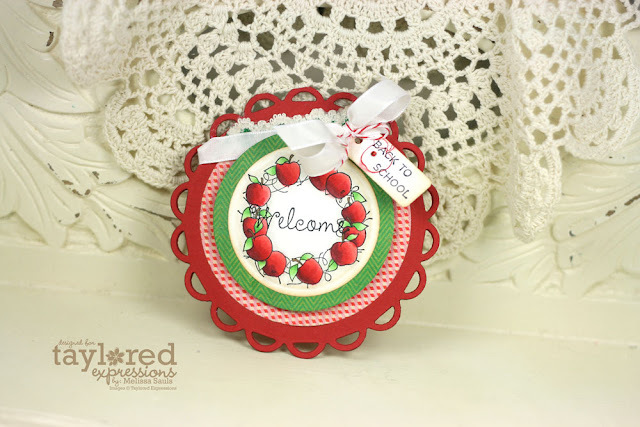 I created this using one of the latest TE Petite stamps, Apple Wreath. I didn't get a chance to stamp with this at the latest release so I couldn't wait to create something with it when I had a chance! I love the apples on the wreath, just like I love the strawberries on the Strawberry Wreath...something about those red fruits I guess! I stamped my wreath image in Memento Tuxedo Black and then colored in with my favorite Copics. Ok, I have to head off and spend the rest of the day at the gym now. Have you been as gluttonous as me over the holidays? lol! Hey everyone! 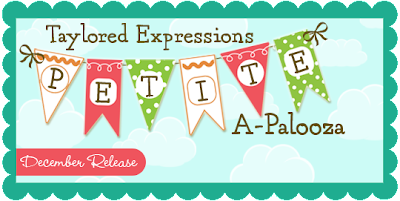 I'm sneaking in with a very quick post with a couple of CAS style cards I made using one of my oldie, but goodie, favorite Taylored Expressions sets, Winter Wonderland. I started with a very simple design using some Kraft cardstock and Alabaster chalk ink. I then stamped my greeting with Warm Red. To add a little more bling, I used the varied sizes from Taylor's Crystal Twinkles. I like how very quickly this card came together...GREAT for mass production at this very last minute, right?! 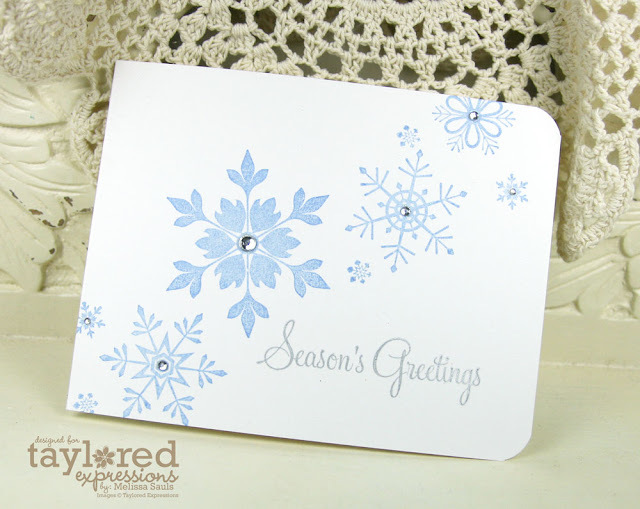 Here, I stamped on some shimmering white cardstock with French Blue chalk ink and greeting in Silver ink. Quite stunning in person! I also used different snowflakes from the very same set. Easy peasy! Thanks for looking and have a great rest of the weekend! Hello everyone!! I can officially tell you that my Anatomy class is DONE! WOOOHOO!! I'm totally celebrating here. It's been a grueling past few months but I think it's definitely going to be worth it all in the end....one step closer to doing, what I think, is my true calling. Anyway! My poor blog has been pretty neglected. I've still been creating every spare chance I can, and here is a project I shared on the Maya Road blog. 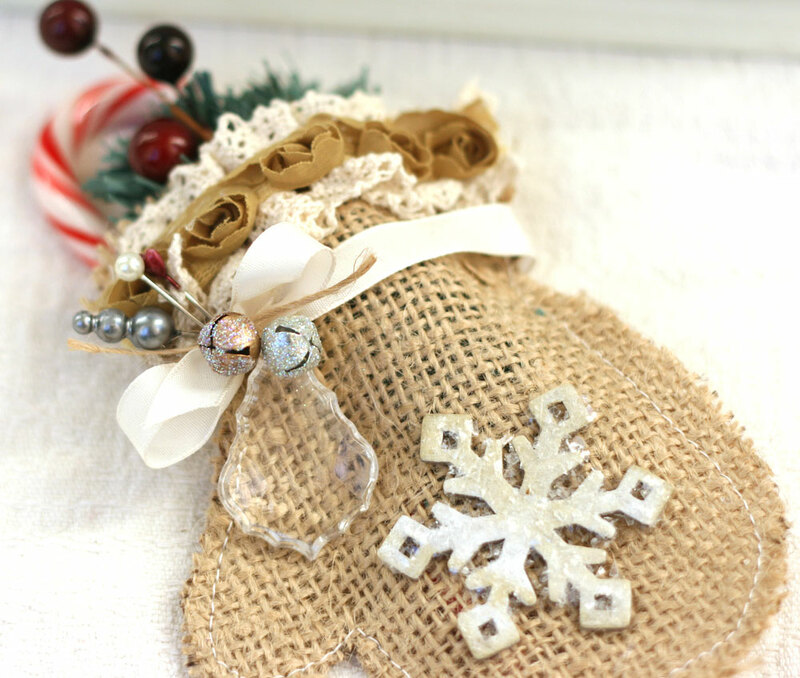 I created this cute little burlap sac using their Acrylic mitten album as a template. I was thrilled that it made the perfect sized little gift sac and it was SUPER easy to put together! 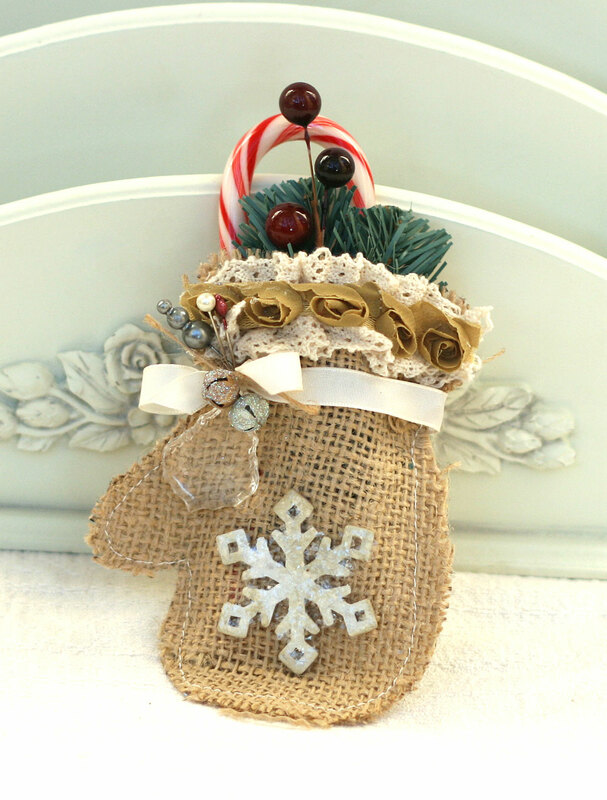 With a handful of Maya Road embellishments, I was really able to dress it up too...I just love it! Perfect teacher gift, imo! Be sure to check out my post for some instructions and a link to all the products I used HERE! Thanks for hanging out with me while my posting has been so spotty...and lacking! I promise to visit more this month....and hopefully next month too! Until Physiology class starts next mid-January, LOL! Yay!!! It's release day and as you read this, everything you have seen (plus what you see today!) is now available for purchase!! Today the Bakers and I are showing two last projects, so I'm going to just get started now! This has to be one of my most favorite projects from the release! I positively adore this new Strawberry Wreath, another Petite set in the Seasonal Wreath series illustrated by the super talented Nancy McKinney for her Whimsical Wishes line of stamps. Whew! That was a mouthful. 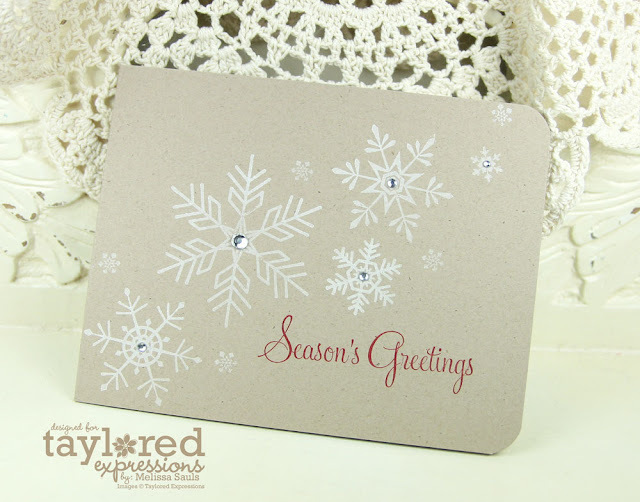 :) And remember how I said you would be seeing more projects using the October Afternoon Taylored Card Kit from yesterday? Welp! Here it is!! All the papers and accessories are straight from the kit! The only thing I added was my Copics for coloring. :) And this set also coordinates with one of my all time favorites, Berries & Cherries. You like?! You know I have to have at least one Clean and Simple project per release and this is that one! This new Petite is called Sky's The Limit, and this set was illustrated by Emily Burger for her Embracing Grace line of stamps. This Petite actually has 3 coordinating dies, so I couldn't resist using this set for my last project! I love the whimsical balloons, and I actually stamped using all 3! Once again, same October Afternoon Taylored Card Kit used here. ;) See how much mileage one kit can give ya?! So I hope you have loved all you have seen so far. Plenty of great Petite sets for gift giving so get right to it!